FOUND AN INJURED ANIMAL IN VICTORIA? CALL 1300 BADGAR FOR ASSISTANCE. If you currently have an animal that you've found, it's extremely important to keep the animal in a warm, dark and very quiet place. Our wildlife is so delicate and they can often die from stress alone caused by handling. It may appear docile and friendly, but often this is a sign of injury and extreme stress. 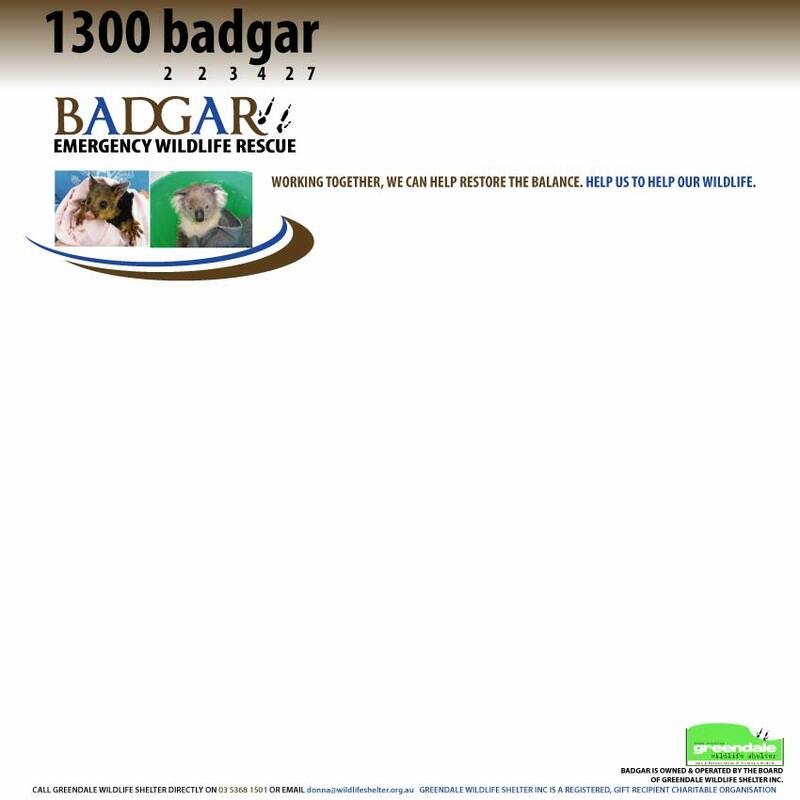 Please don't let your children nurse the animal, report it to BADGAR straight away. That way you know you're doing the RIGHT thing. 24 hours a day, 7 days a week, our team of BADGAR level trained rescuers work tirelessly to help restore the balance for our wildlife that has been injured, orphaned or is sick. Becoming a BADGAR wildlife rescuer is a great step. We'll train you to our level of operation and before you know it, you'll be experiencing wonderful moments with wildlife. Of course, it's not always a pleasant experience. It's estimated that up to 80% of our rescues are euthanasia operations. Being able to confidently do this is just as important as the other rescue techniques. You can donate as much or as little time as you like, every one of our members is greatly valued. You'll join our great family, eat and drink, train, progress and love your BADGAR life! BADGAR has developed a unique rescue level system, which our members can choose to progress to an advanced level through. Level 4 is entry level and has set requirements, the system then grades to a BADGAR level 1 rescuer who coordinates bushfire response crews, police training and so on. Remember, you must not keep wildlife as pets and we strongly advise that you do not attempt to care for injured or orphaned wildlife. There are strict rules enforced by the government authorities in each state and heavy penalties may be applied to those offenders. The best option for yourself and the animal is to contact your nearest shelter, or call 1300 223 427.